Lower right corner: "P. Saenredam F. AD 1628"
Light fills the interior of the Church of Saint Bavo in Haarlem, one of the finest Gothic buildings still in existence today. Although Pieter Jansz. Saenredam based his work on careful on-the-spot studies, the painting combines two distinct views, one looking straight ahead and the other toward the chancel on the left. He even added an altarpiece and a stained glass window, which would probably already have been removed from the church by Saenredam's time. By the 1600s, Protestant churches in Holland had become relatively austere in response to the teachings of theologian John Calvin. The overall impression is one of strong verticality, soaring space, and penetrating light, a spiritual reference to the heavens above. The inclusion of small figures accentuate the viewer's experience of exalted interior space. Saenredam described architectural elements in great detail: vaulted ceilings, moldings, decorative capitals, clustered pillars, and clerestory windows. Adolphe Schloss, 1842 - 1910 (Paris, France), by inheritance to his wife, Lucie (Haas) Schloss, 1911. In possession of the Vichy government of France (Chambon, France; Paris, France), sequestered by the French State Museums at the Musée du Louvre, 1943. Harold Samuel, 1912 - 1987 (Wych Cross Place, Sussex, England), sold to Edward Speelman, by 1985. Edward Speelman, Ltd. (London, England), sold to the J. Paul Getty Museum, 1985. Jantzen, Hans. Das Niederländische Architeckturbild (Leipzig: Klinkhardt & Biermann, 1910), pp. 80-81, 168. Six, J. "Pieter Saenredam." Bulletin van den Nederlandschen Oudheidkundigen Bond, 2nd ser., 3 (1910), p. 22. Regteren Altena, Johan Quirijn van. "Saenredam archaeoloog." Oud-Holland 48 (1931), p. 1. Stechow, Wolfgang. "Saenredam, Pieter Jansz." In Allgemeines Lexikon der bildenden Künstler von der Antike bis zur Gegenwart. Ulrich Thieme, Felix Becker, and Hans Vollmer, eds. 37 vols. (Leipzig: Seeman, 1907-50), vol. 29 (1935), p. 306. Swillens, P. T. A. Pieter Janszoon Saenredam: Schilder van Haarlem, 1597-1665 (Amsterdam: De Spieghel, 1935; repr., Soest: Davaco, 1970), pp. 9, 46, 55-56, 82, no. 33, pl. 64. Martin, Dr. Wilhelm. De Hollandsche Schilderkunst in de Zeventiende Eeuw. 2nd ed. Vol. 1, Frans Hals en Zijn Tijd (Amsterdam: J. M. Meulenhoff, 1936), p. 280. Galerie Charpentier, Paris. Collection de feu M. Adolphe Schloss (deuxième vente): Tableaux anciens. December 5, 1951, lot. 51, ill.
17e eeuwse meesters uit Gelders bezit, exh. cat. (Arnhem: Gemeentemuseum, 1953), p. 21, no. 57, ill.
Wilde, Johannes, ed. Holländer des 17. Jahrhunderts, exh. cat. (Zurich: Kunsthaus, 1953), pp. 84-85, no. 186, entry by M. Elisabeth Houtzager. Salerno, Luigi, ed. Mostra di Pittura Olandese del Seicento, exh. cat. (Rome: Palazzo della Esposizioni, 1954), p. 79, no. 136. Hannema, D. Catalogue Raisonné of the Pictures in the Collection of J. C. H. Heldring (Rotterdam: Ad. Donker, 1955), pp. 6, 47-49, no. 27, pl. 10. Kunstschatten uit Nederlandse Verzamelingen, exh. cat. (Rotterdam: Museum Boymans, 1955), pp. 53-54, no. 113, ill.
Isarlo, George. Les Indépendants dans la peinture ancienne (Paris: La Bibliothèque des Arts, 1956), pp. 150, 156, fig. 82. Leymarie, Jean. La peinture hollandaise (Geneva and Paris: Skira 1956), p. 150. Hendrik Heldring, Johannes Carel, ed. Collectie J. C. H. Heldring te Oosterbeek, exh. cat. (Arnhem: Gemeentemuseum, 1958), pp. 22-23, no. 27, ill.
Catalogus van Schilderijn uit de XVe tot en met de XVIIIe Eeuw, exh. cat. (Otterlo: Rijksmuseum Kröller-Müller, 1959), p. 62. Plietzsch, Eduard. Holländische und flämische Maler des XVII. Jahrhunderts (Leipzig: E. A. Seemann Verlag, 1960), p. 119, fig. 201. Houtzager, Maria Elisabeth, ed. Collectie J. C. H. Heldring te Oosterbeek, exh. cat. (Utrecht: Centraal Museum, 1960), pp. 24-26, no. 32, ill.
Houtzager, Maria Elisabeth. Pieter Jansz. Saenredam: Published on the Occasion of the Exhibition Pieter Jansz. Saenredam (Utrecht: Centraal Museum, 1961), pp. 98-99, no. 55, fig. 56. Sotheby's, London. Important Old Master Paintings. March 23, 1963, lot 17, ill.
Art-Price Annual, n. s., 18 (1962-63), p. 450. Sotheby's advertisement. Burlington Magazine 105, no. 719 (February 1963), p. iii, ill.
Sotheby's advertisement. Art in America 51, no. 2 (April 1963), p. 7, ill.
"International Saleroom." Connoisseur 153 (June 1963), p. 136, ill., fig, 2. "Coup d'oeil sur les grandes ventes de printemps." L'Oeil 102 (June 1963), pp. 42-44, fig. 4. Heckmanns, Friedrich Wilhelm. "Das Problem der Raumform in der Interieurmalerei des Pieter Janszoon Saenredam, 1597-1665." Ph.D. diss. (Westfälischen Wilhelms-Universität zu Münster, 1963), pp. 20, 55, 64, no.4. Heckmanns, Friedrich Wilhelm. Pieter Janszoon Saenredam: Das Problem Seiner Rauform (Recklinghausen: Verlag Aurel Bongers, 1965), pp. 20, 55, 64, no. 4. Rosenberg, Jakob, Seymour Slive, and E. H. Ter Kuile. Dutch Art and Architecture, 1600 to 1800 (Baltimore: Penguin Books, 1966), p. 189. Carter, B. A. R. "The Use of Perspective in Saenredam." Burlington Magazine 109, no. 775 (October 1967), p. 594. Liedtke, Walter. "Saenredam's Space." Oud Holland 86 (1971), pp. 125-26, 130, 134, 137, 140, fig. 5. “Saenredam ou Zaenredam (Pieter Jansz ou Janszoon).” In Dictionnaire critique et documentaire des peintres, sculpteurs, dessinateurs et graveurs. E. Bénézit, ed. Rev. ed. Vol. 9, Robbia-Styppax (Paris: Librairie Gründ, 1976), pp. 222-23. Jantzen, Hans. Das Niederländische Architekturbild. 2nd ed. (Braunschweig: Klinkhardt & Biermann, 1979), pp. 80-81, 232. Connell, E. Jane. "The Romanization of the Gothic Arch in Some Paintings by Pieter Saenredam: Catholic and Protestant Implications." Rutgers Art Review 1 (January 1980), pp. 22-24, fig. 4. Liedtke, Walter A. Architectural Painting in Delft: Gerard Houckgeest, Hendrick van Vliet, Emanuel de Witte (Groningen: Davaco, 1982), p. 91. Macandrew, Hugh, et al., eds. 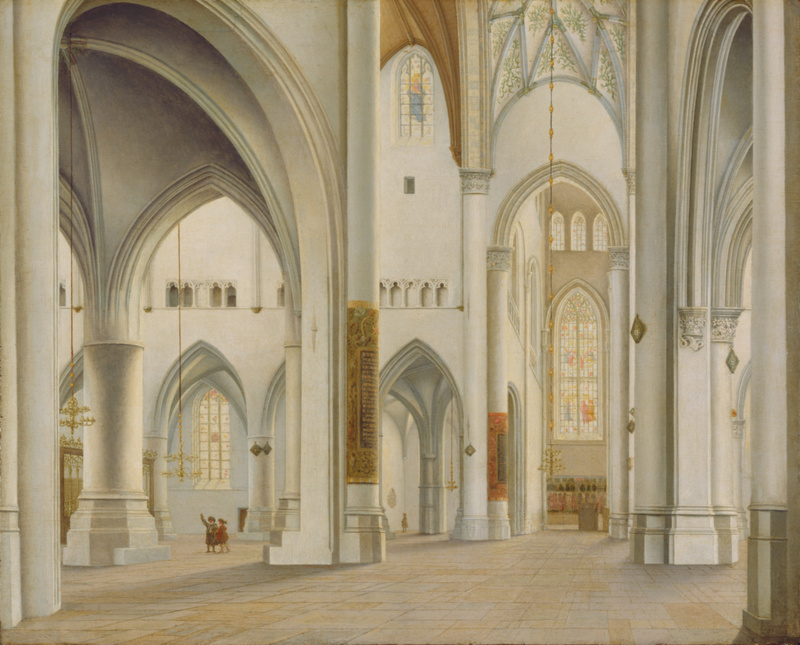 Dutch Church Painters: Saenredam's 'Great Church at Haarlem' in Context, exh. cat. (Edinburgh: National Galleries of Scotland, 1984), p. 21. Foucart, Jacques, ed. Anciens et Nouveaux: Choix d'oeuvres acquises par l'état ou avec sa participation de 1981 à 1985, exh. cat. (Paris: Galeries Nationales du Grand Palais, 1985), p. 123. "Acquisitions/1985." The J. Paul Getty Museum Journal 14 (1986), p. 217, no. 122. Hoving, Thomas. "Money and Masterpieces." Connoisseur 216, no. 899 (December 1986), pp. 94-95, ill.
Briels, Jan. Vlaamse schilders in de noordelijke Nederlanden in het begin van de Gouden Eeuw, 1585-1630 (Haarlem: H. J. W. Becht, 1987), pp. 281-82, fig. 350. Niederländische Malerei des 17. Jahrhunderts aus Badapest, exh. cat. (Cologne: Wallraf-Richartz-Museum, 1987), p. 40, ill.
Ruurs, Rob. Saenredam: The Art of Perspective (Amsterdam, Philadelphia, and Groningen: Benjamins/Forsten Publishers, 1987), pp. 116-17, n126. Fredericksen, Burton B. Masterpieces of Painting in the J. Paul Getty Museum. Rev. ed. (Malibu: J. Paul Getty Museum, 1988), unpaginated, no. 21, ill.
Ruurs, Rob. "Un tableau de Pieter Saenredam (1597-1665) au Louvre: Intérieur de l'église Saint-Bavon à Haarlem." La Revue du Louvre et des Musées de France 38 (1988), p. 42n4. Schwartz, Gary, and Marten Jan Bok. Pieter Saenredam: The Painter and His Time (New York: Abbeville Press, 1989), pp. 63, 71, 83, 261, 326, no. 55, fig. 67. Sutton, Peter C. Dutch and Flemish Seventeenth-Century Paintings: The Harold Samuel Collection (Cambridge: Cambridge University Press, 1992), pp. 6, 8, fig. 6. Jaffé, David. Summary Catalogue of European Paintings in the J. Paul Getty Museum (Los Angeles: J. Paul Getty Museum, 1997), p. 115, ill.
Fredericksen, Burton B., et al. Masterpieces of the J. Paul Getty Museum: Paintings (Los Angeles: J. Paul Getty Museum, 1997), p. 55, no. 29, ill., entry by Burton B. Fredericksen. The J. Paul Getty Museum Handbook of the Collections. 6th ed. (Los Angeles: J. Paul Getty Museum, 2001), p. 117, ill.
Mochizuki, Mia Margaret. "The Reformation of Devotional Art and the Great Church in Haarlem." PhD. diss. (Yale University, 2001), p. 179, fig. 3.38. Helmus, Liesbeth M., ed. Pieter Saenredam: The Utrecht Work: Paintings and Drawings by the 17th-century Master of Perspective, exh. cat. (Los Angeles: The J. Paul Getty Museum, 2002), pp. 10, 12, figs. 3-4. Allen, Denise, et al. Masterpieces of Painting in the J. Paul Getty Museum. Rev. ed. (Los Angeles: J. Paul Getty Museum, with Thames & Hudson, 2003), p. 51, no. 26, ill., entry by Burton B. Fredericksen. Mochizuki, Mia M. "The Dutch Text Painting." Word & Image 23, no. 1 (January-March 2007), pp. 72-73, fig. 1. The J. Paul Getty Museum Handbook of the Collections. 7th ed. (Los Angeles: J. Paul Getty Museum, 2007), p. 116, ill.
Helmus, Liesbeth M., and Gerdien Wuestman. Saenredam: La fachada occidental de la iglesia de Santa María de Utrecht, exh. cat. (Madrid: Museo Thyssen-Bornemisza, 2008), pp. 32-33, 65, 85, no. 2, ill.
Mochizuki, Mia M. The Netherlandish Image after Iconoclasm, 1566-1672: Material Religion in the Dutch Golden Age (Aldershot: Ashgate, 2008), pp. xxiv, 1, 282, 325-26, ill. figs. I.1, C.4. Mochizuki, Mia. "The Bible on the Wall." In Infant Milk or Hardy Nourishment? The Bible for Lay People and Theologians in the Early Modern Period. W. François & A.A. Den Hollander. eds. (Leuven: Uitgeverij Peeters, 2009), pp. 354, 366, fig. 13. Grell, Ole Peter, ed. A151 Making Sense of Things: An Introduction to Material Culture. Book 2: Contexts (Milton Keynes: The Open University, 2011), pp. 103-4, fig. 2.18. Vanhaelen, Angela. The Wake of Iconoclasm: Painting the Church in the Dutch Republic (University Park: Pennsylvania State University Press, 2012), pp. 85-86, fig. 26. Liedtke, Walter. "Dirck van Delen's 'Solomon Receiving the Queen of Sheba' of 1642." Cantor Arts Center Journal 7 (2010-2011), pp. 19-20, fig. 2. Dikken, Charlotte. "Transparent meanings? : Intended communicative functions of medieval stained-glass windows in the Low Countries." Ph.D. diss. (Universiteit Utrecht, 2016), pp. 383, 385, fig. 68. Students learn about shapes in architecture by painting their school and writing a reflective summary of their study of architecture. Lesson in which students explore architectural structures/nature in paintings; describe a painting's mood, draw, write poetry, make a camera obscura. Lesson in which students learn about architectural elements and vantage points in paintings; and how 3-D shapes are transformed into 2-D forms.